Military Officers Association of America (MOAA) and the Institute for Veterans and Military Families at Syracuse University (IVMF) have announced the results of a national study focused on military spouse employment. 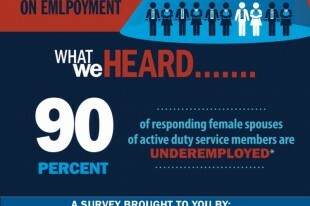 The presentation will be made on Feb. 12 at MOAA’s Military Spouse Symposium in San Antonio, hosted in partnership with JPMorgan Chase & Co.
A major finding was that 90 percent of responding female spouses of active duty service members report being underemployed, meaning they possess more formal education/experience than needed at their current or most recent position. Additionally, the 2012 American Community Survey (ACS) data show military spouses make an average of 38 percent less total personal income and are 30 percent more likely to be unemployed than their civilian counterparts. This infographic summarizes the report’s findings. 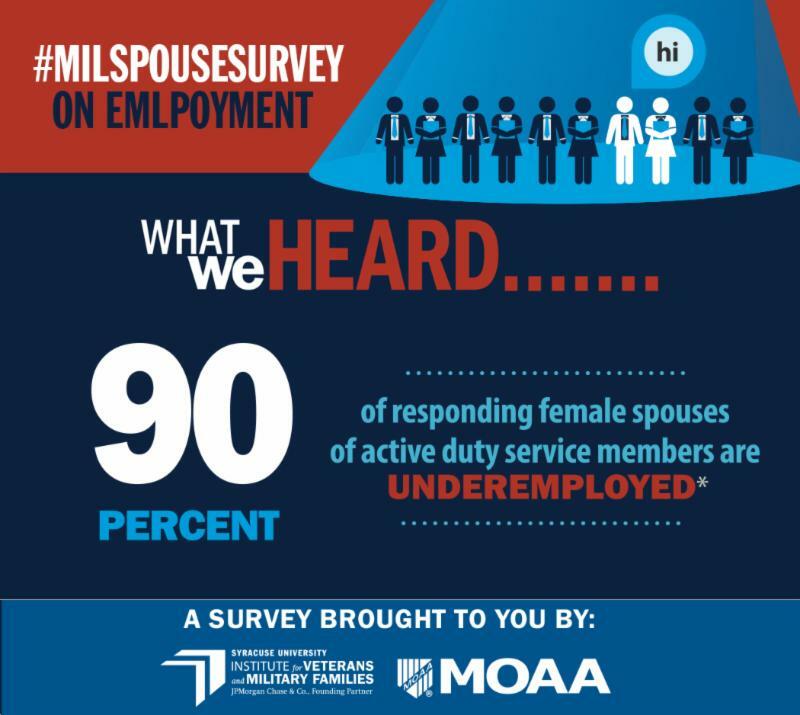 “The results of the 2013 Military Spouse Employment Survey demonstrate a need for concerted efforts to improve the employment issues currently faced by military spouses,” MOAA President Vice Admiral Norb Ryan says. While ACS data consistently show noticeable gaps in income and unemployment between armed forces spouses and their civilian counterparts, this survey discovered there is not a lack of desire to work that is causing these gaps; more than 55 percent of respondents indicated they “need” to work, while 90 percent indicated they “want” to work. However, active duty military spouses are more likely to have moved within states, across states and abroad, compared to their civilian and veteran counterparts. The increased likelihood of moving from one geographic location to another further compounds economic issues for these families. According to survey results, other factors affecting their unemployment or underemployment include relocating to geographic locations with limited employment opportunities, employer perceptions of military spouses, inability to match skills and education to jobs, inflexible work schedules and high childcare costs. In 2012, 18- to 24-year-old armed forces female spouses had the highest unemployment rates at 30 percent (which is almost three times higher than their civilian counterparts at 11 percent). Armed forces female spouses between the ages of 25 and 44 had the second-highest unemployment rates at 15 percent (almost three times higher than their civilian counterparts at 6 percent). More than 50 percent of respondents indicated their chosen career field requires licensing or certification and 73 percent require renewal/reissuing after a PCS move, costing an average of $223.03. Respondents reported being underemployed with respect to education (33 percent), experience (10 percent) or both (47 percent). Income significantly differs based on educational attainment and whether the military spouse is working in their preferred career field. These and other findings, including recommendations to address the issues of military spouse employment, are detailed in a summary report titled “The 2013 Military Spouse Employment Report.” Infographic highlights of the report findings can be found here.